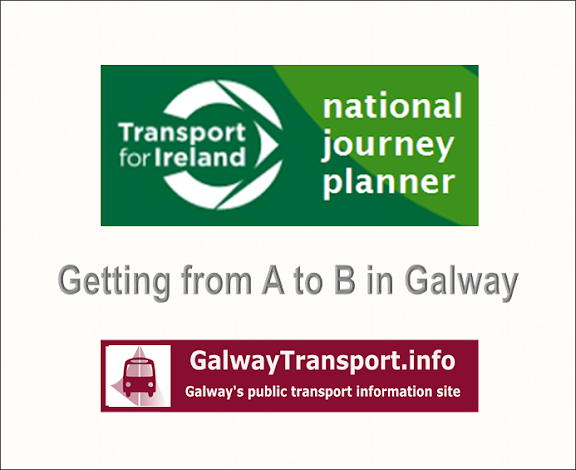 This page lists items featured in the "News" section of GalwayTransport.info. 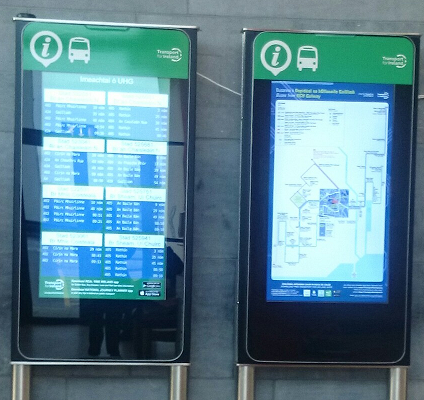 We aim to list all public transport services and information sources that relate to actual services being offered to, from and through Galway city, right now. Planned services unless they have an announced start date and have accepted bookings. Direct advertising from public transport providers is not accepted. However new services and changes are publicised - for free - when they occur. News embargo dates requested by public-transport providers are respected. so that announcements here do not impact on planned publicity campaigns. Services from Dublin Airport now have a new stop, closer to the terminal building. The multi-stop service is now called CityLink Commuter, and offers 10-trip, annual tax-saver and student tickets, and a stop at Athlone IT. There is also a 12-midnight departure from Dublin City. Full details. 17 Nov: From 22 Nov, Bus Éireann route X51 / 51X (Galway - Limerick express) will use the Gort bypass: journey time will be 80 minutes. Updated timetable (link coming soon). Also, some X51s will serve University of Limerick (UL) and Limerick Institute of Technology (LIT) on Friday and Sunday - details. 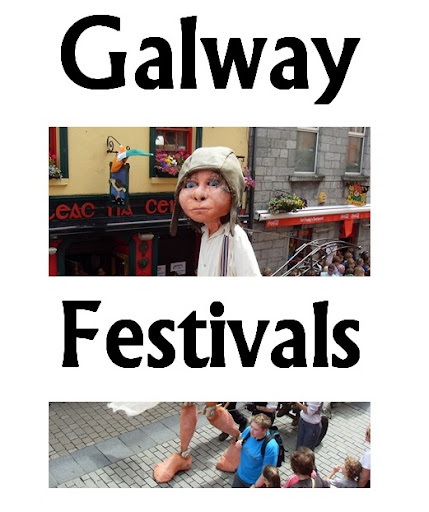 18 Oct: Galway Airport departure tax starts on 1 Nov 2010, €10 per passenger over 12. Flights booked before 11 Oct 2010 are exempt. More info. The 6:05hrs Galway to Dublin (Heuston) is replaced by a 6:35am, stopping at Athenry and Athlone, arriving in Dublin at 8:50am. This service doesn't stop at Woodlawn or Ballinasloe. The 7:05am Athlone to Galway service is replaced by 7:26am stopping at Ballinasloe Woodlawn, Attymon and Athenry. Arrives in Galway at 08:30. The 6:40am Galway to Limerick now leaves Athenry at 6:58, Craughwell at 7:07 and Ardrahan at 07:18am. Full details. 9 Sept: Farrell Travel (Athenry to Galway) have introduced a ticket concession scheme. Applies to day and Night Link services. Participating shops/pubs/restaurants etc listed on their website. 7 Sept: Oranmore Business Park layout map and NUIG-area neighbourhood map added to GalwayTransport.info. 22 Aug: City Direct are encouraging bus use by offering free September travel for a child to the first 50 people who respond. Details. 10 Aug: Bus Éireann are splitting the Galway-Dublin Route into routes 20 and 20X: the 20X service stops at Loughrea, Ballinasloe and Athlone, Dublin Airport then Dublin City. Each route departs once every two hours. Starting 15 August. Press release. Timetable. 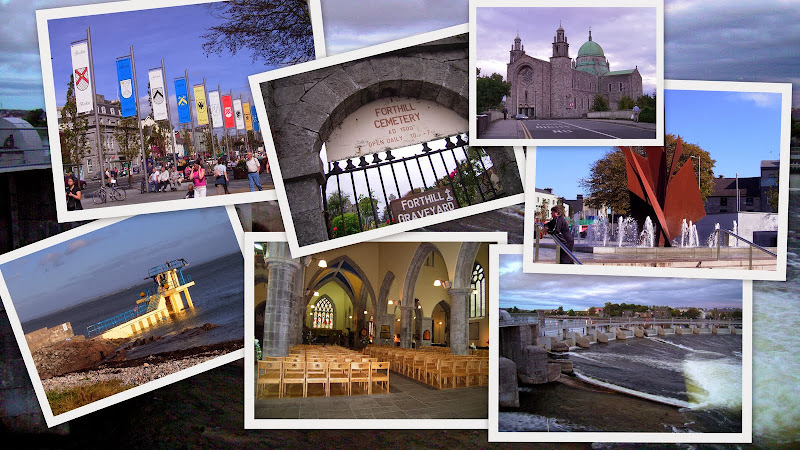 11 Jul: Other Churches and Houses-of-Worship map added to GalwayTransport.info. 5 Jul: Manxx2.com now fly from Galway to Cork and Belfast. 3 Jul: Bus Éireann have reduced services on route 424 (Galway - Barna - Furbo - Inverin - Rossaveal - Spiddal - Carraroe - Lettermullen). Updated timetable. 28 June: Liosbán Industrial Estate layout map added to GalwayTransport.info. 3 June: Powerboat Festival at Salthill, Fri 5th - Mon 7th of June 2010. 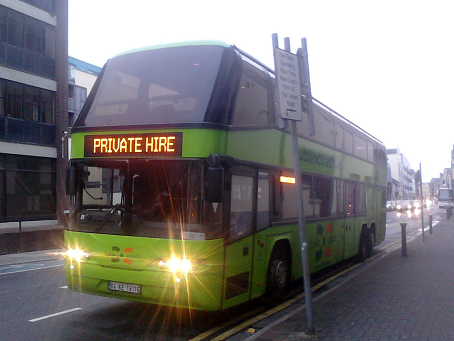 Shuttle Service from Eyre Square to the City - operated by Bus Éireann, €2. 1 June Body and Soul, Leonard Cohen and Electric Picnic added to the Event transport page. 23 May: Event transport page added to the site. First event listed is Oxygen. 31 Mar: Easter 2010 bus services. 10 Mar Bus Éireann have announced the next service-changes due to their cost recovery plan. 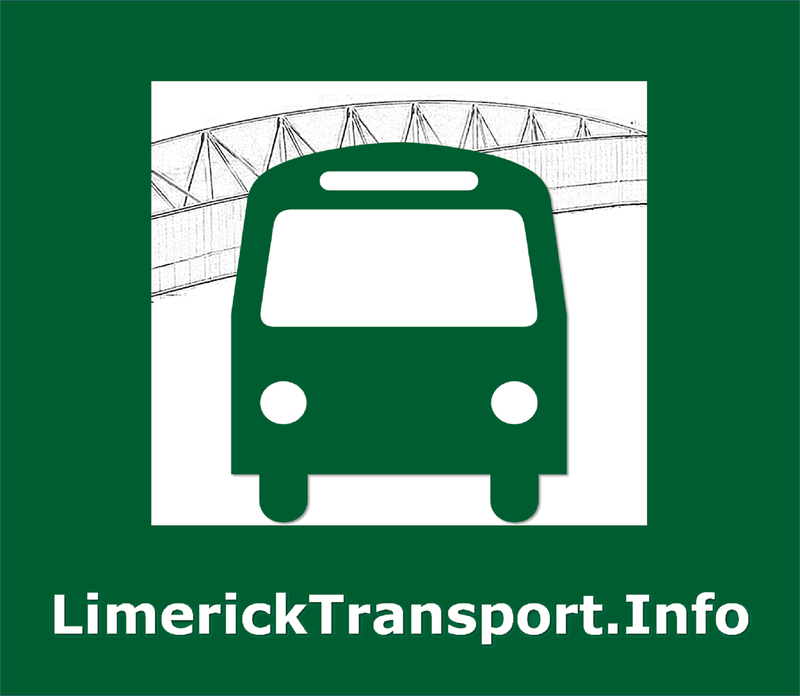 Route 70 to Galway-Athlone once per day is cancelled from 28 March. Status of the Sunday pm #70 Galway to Athlone IT unknown as yet. Full details. 17 Feb CityLink cuts the Galway - Shannon Airport service to 6 departures per day, from Mon 22 Feb. Details. 10 Feb: Irish Rail's Galway-Limerick train service starts on 30 March. Details. Five services daily - see the Journey Planner for times. 30 Jan: Bus Éireann have announced the first service-changes due to their cost recovery plan. See their statement, or this summary for Galway. 28 Jan: Farrell Travel have a new-look website, and are running a Nightlink Galway-Athenry service (Thurs-Sat), and are offering some new fare-discounts.